“Repair is a radical act.” Or so goes the slogan for Patagonia’s Worn Wear program, which employs 45 full-time techs to repair about 40,000 used garments each year. For its part, The North Face just launched Renewed, a program that also encourages people to buy, sell or trade used items. 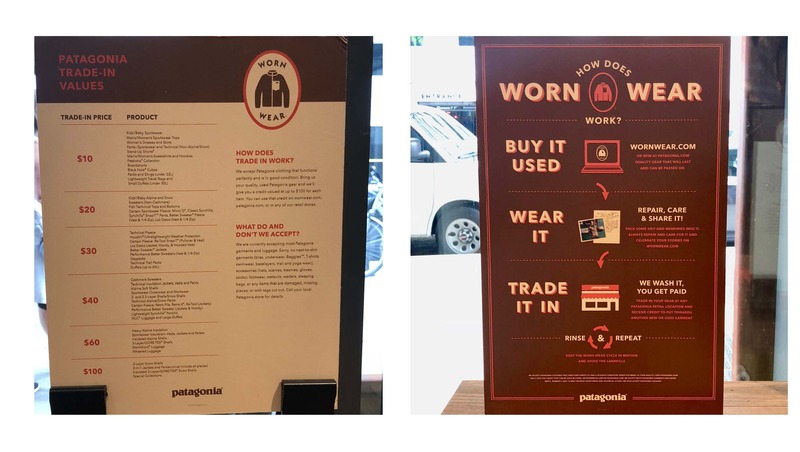 This past June I visited Patagonia’s Magnificent Mile store and saw the bin where you can toss your old fleeces, ski hats, fishing waders and parkas. It made perfect sense for a company so laser-focused on sustainability—but it also works for branding. The push to repair and renew existing items has several benefits besides the environmental ones. New customers will be exposed to the brand through better pricing ($80 for a Worn Wear fleece vs. $120 new), and these moves are constant with the more secular trend toward the normalization of consignment as we’ve described before with TheRealReal and Rebag. Patagonia’s Ironclad Guarantee and North Face’s lifetime warranty underscore the enduring nature of these high-quality products. But what if, deep down, what you really want is something new? Worn Wear and Renewed give shoppers some guilt-free entry points. They can pick up a repaired fleece in great condition or toss an old one in the bin and hit the racks in search of a brand-new replacement—plus you can use your $30 credit for dropping off the old one. Feel good, do good, buy luxury fleece for your adventures.